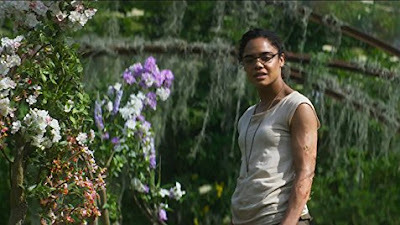 From Director Alex Garland (Ex Machina) comes sci-fi adventure Annihilation. Biologist and former soldier Lena (Academy Award winner Natalie Portman) is shocked when her missing husband (Oscar Isaac) comes home near death from a top-secret mission into The Shimmer, a mysterious quarantine zone no one has ever returned from. Now, Lena and her elite team must enter a beautiful, deadly world of mutated landscapes and creatures, to discover how to stop the growing phenomenon that threatens all life on Earth. The film also stars Jennifer Jason Leigh, Gina Rodriguez, Tessa Thompson, and Tuva Novotny. Lena (Natalie Portman) is a biology professor who has not heard a word about her husband Kane (Oscar Isaac) for more than year. She assumes he has been killed in action and has stopped asking for answers from his superior officers. She has thrown herself into her work and is trying to move on. As she paints her bedroom one night Kane walks through the door. He is clearly not himself and his health deteriorates quickly. The ambulance is re-directed to a military facility where Kane is placed on life support. Lena learns that Kane was the only one to return from The Shimmer, a mysterious quarantine zone. Something inside has made Kane sick and Lena joins the team that will investigate. The Shimmer is growing in size and threatens to envelop the base and eventually part of the country. The military wants answers and Lena wants to save her husband, who is now in a coma. Kane has Multiple organ failure and internal bleeding but no one knows why. 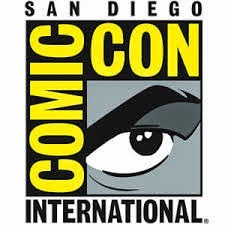 Lena will join Psychologist Dr. Ventress (Jennifer Jason Leigh), Paramedic Anya (Gina Rodriguez), Physicist Josie (Tessa Thompson) and Geomorphologist Cassie (Tuva Novotny). The four brave women will enter The Shimmer to determine if something killed the previous teams or if they went crazy and killed each other. Annihilation unravels slowly for the viewer. It is clear that bad things happen inside The Shimmer but the team is disoriented and unable to communicate. There are unexpected discoveries along the journey and dangers at every turn. As the movie progresses, it’s visually very interesting inside the Shimmer. With so much to look at it strikes me that this would be an even better book to read. The strong female cast can certainly hold their own. Natalie Portman is tiny but she acts like she knows her way around a machine gun. Gina Rodriguez, who did her own stunts, is tougher than you’d believe if you’ve only seen her on "Jane the Virgin." If Dwayne Johnson is not available to save me during the next real life disaster situation I’d take any of the women in this film instead. 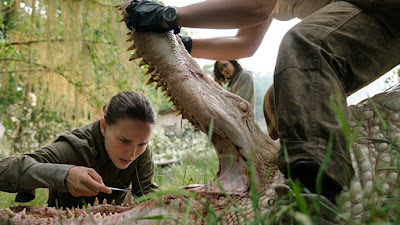 Annihilation does have some pretty gory moments. If you are squeamish about blood there is more than one moment in the film that will make you want to cover your eyes. 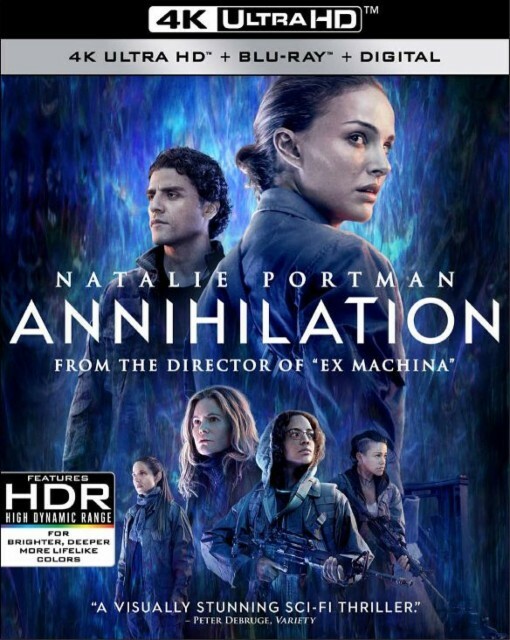 Annihilation’s UHD release is far superior to the Blu-ray included in the 4K set. The digital film is flat and the Blu-ray is hazy. The UHD on the other hand offers a different visual experience. The Shimmer’s distortions and refractions of light are perceptible and the coloring is impressive. The color boost is the most significant difference but you’ll also notice increased detail and sharpness. White balance is a problem with the Blu-ray and the UHD is the only way to go. Annihilation's Dolby Atmos soundtrack is well balanced and handles the passive soundtrack with ease. Elements like the buzz of fluorescent light bulbs add to the overall ambiance. Later on, there will be machine gun fire to ramp up the volume. Finally, an animals growls give the listener a layered listening experience. Dialogue is even and intelligible throughout – even Natalie Portman who doesn’t have the strongest speaking voice. The overall audio experience is above average. The UHD does not contain any extras. The following featurettes are limited to the Blu-ray disc. Each two part extra is available with play all functionality. Refractions (11:20) – The challenges of adapting the book and the process of creating the visuals is discussed. For Those That Follow (15:04) – The ensemble cast and the energy that each actress brought to the project. The qualities of the characters and the casting choices are discussed. Shimmer (12:12) – Communication and the value of sequential shooting, subbing the UK for American swamps, and a look at production design and practical sets. Stunt work and special effects are touched on here. Vanished Into Havoc (15:03) More detail about the practical effects and digital images in combined for the film. The elements of the mutated bear are explored and the attack sequence is explained. Unfathomable Mind (11:46) – The two big visual effects challenges – The Shimmer and the things that causes it. The Last Phase (8:06) – Director/Screenwriter Alex Garland’s qualities and the crew he’s been working with for twenty years. The actors and crew discuss what they enjoyed about the film and what they got from the project. Annihilation is interesting to say the least. The premise of the film is that you’re not sure what’s going on in The Shimmer. There are all kinds of plant and animal mutation and you’re not sure what’s real as the explorers make their way to the Lighthouse. The ending is a bit predictable but it doesn’t necessarily take away from the experience. The film is visually enjoyable and the 4K UHD is far superior to the Blu-ray. The extras are worth while and cover all the main interest points. Recommended.